"I am who I am today because of the time I spent in Monash University discovering and defining myself, both in and out of the classroom." Jeffrey Cheah Foundation-Monash University Equity Scholar, Alicia Tan is no stranger to success. During her stint in Monash, she has participated and won many national competitions. 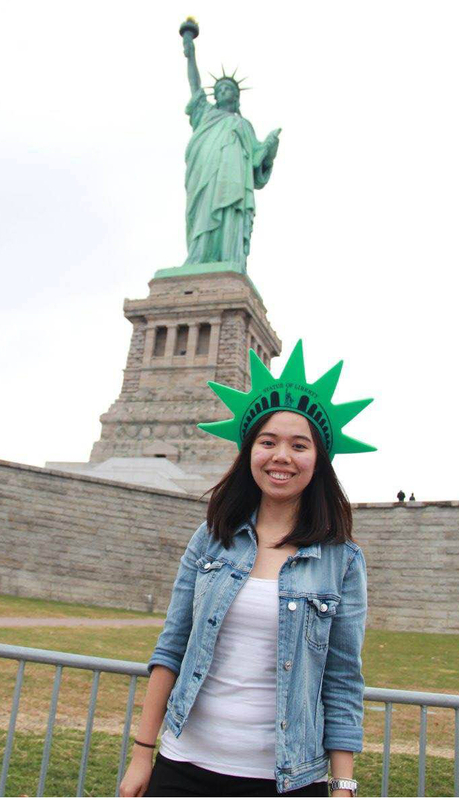 To add to her list of accolades, the Accounting and Banking & Finance graduate was recently awarded a Fulbright Scholarship (Malaysian Graduate Study and Research Program), to pursue a Masters in Data Science. Charis Wong, Head of Strategy from the Monash Malaysia Business Alumni Chapter (MMBAC) spoke to the Finance Management Associate in Astro Malaysia Holdings about her scholarship journey. Who played an instrumental role in your life, and why? As cliche as it may sound, I have been blessed to be surrounded with a very supportive group of family and friends. However, I will be always grateful to this one individual who believed in my potential before I even realised it myself - Zubair, who held the position of Procter & Gamble’s HR manager. He challenged the rules of the company to allow me, a first year student to participate in my first international business challenge (it was only open for penultimate and final year students). Long story short, I won the competition and ended up flying to Singapore to represent Malaysia in the regional round. I have been pushing forward ever since by representing the university at various competitions, which ultimately led to opportunities to represent Malaysia at different international engagements to champion causes I truly care about. How did you make the best of your time in Monash, and subsequently - in Astro? My first year at Monash was pure manic as I was jumping on every opportunity - from running student events with the council, to working part time at the student recruitment office. I learnt very quickly that I need to pick and choose what I should focus on, and I made that decision based on the skills I want to build most. I decided to focus on three key activities: completing my degree, working at the student recruitment office, and participating in various business challenges. You’re very involved in YSEALI (Young Southeast Asian Leaders Initiative). Can you please share how you discovered YSEALI, and how it has changed your life? What piqued your interest in Social Entrepreneurship? I was invited to the Town Hall with YSEALI Initiative Fellows in 2015, launched by President Barack Obama, where I had the privilege to meet him! Just a brief lowdown, YSEALI’s objective is to build the leadership capabilities of youth in the region and nurture an ASEAN community. Since its inception, I had the opportunity to represent Malaysia at various U.S. funded programmes, both as a participant and a mentor where I would champion the environmental and social front. YSEALI has defined my life. Besides the technical knowledge gained, YSEALI has also connected me with a network of friends spread across ASEAN and the U.S., who are fuelled by similar passions. It made me realise how globally connected we are in this age, and that no environmental or social issue is exclusive to a particular country. What made you apply for the Fulbright Scholarship, and why a Masters in Data Science - in particular? I have always been a numbers driven person, which was why I majored in Accounting and Finance. During one of my rotations as a Finance Management Associate in Astro, I had the opportunity to learn about the power of data, and it immediately piqued my curiosity. As a society, we have been collecting data for decades, but barely leveraged on its potential - especially when it comes to socioeconomic issues. I truly believe that data - if harnessed properly has the ability to transform the lives of many for the better. Data science has made it possible for us to utilise a vast amount of data and generate greater insights; however, what is lacking is the amount of people passionate enough to fully take advantage of this opportunity to drive change. I applied for Fulbright because I would love nothing more than to be that individual. What were the major challenges you faced when applying for the Fulbright Scholarship? Ensuring that my drive and passion come across clearly in the application, as I do not have prior background in statistics, mathematics or computer science – I had to do a fair share of convincing. What did you think contributed to your success in achieving the scholarship? I believe it is because I know my purpose, enabling me to share with the interviewers why I am driven to do it, and how I will go about achieving it. How did your experience in Monash help bring you to where you are today? I am who I am today because of the time I spent at Monash, discovering and defining myself, both in and out of the classroom. It was because of my lecturers who mentored and guided me through both academics and while I prepared for competitions, the colleagues I worked with, and of course, the friends I shared so much with. What advice would you give to fellow Monash undergraduates, or Alumni who want to create an impact, or to find their passion? How important do you think having a strong Alumni network as well as involvement, is to you, and why? I am a believer of the power of networking. Who knows, the person you had a conversation with at an alumni event might end up being your manager in the near future. I happen to be speaking from experience! As an alumna of Monash, what are the contributions that we can make to our alma mater? Give back to Monash University. I would go back to Monash as and when appropriate to share my experience with current students, in hope to inspire them to do more.